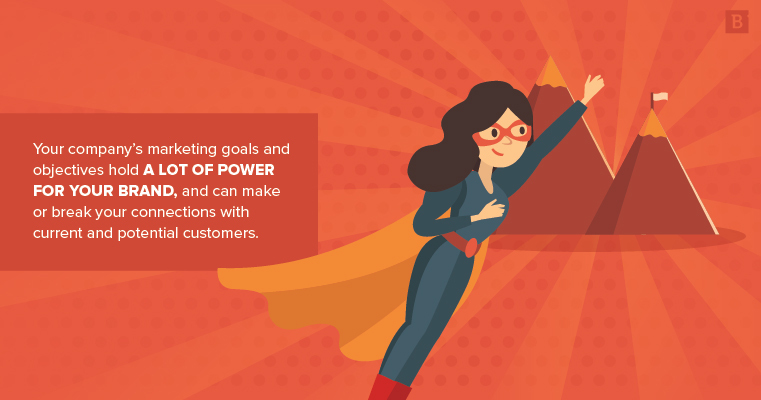 Your company’s marketing goals and objectives hold a lot of power for your brand, and can make or break your connections with current and potential customers. These can be difficult waters to navigate, particularly if internal marketing managers are treating these goals and objectives as one in the same. Let’s be clear: Although there is a definite connection between your goals and objectives, these are two different things. And it’s important to understand how to define your goals and objectives in a way that aligns with your business goals and can put your brand on the path to success. Objectives vs. goals: What’s the difference? “Goals” and “objectives” tend to be used interchangeably, especially when it comes to marketing efforts. However, there is a distinct difference between these two, and overall marketing success depends on understanding what sets your goals apart from your objectives. Goals: These are usually more broadstroke benchmarks that will guide you in shaping your overall marketing strategy. Goals often state the desired results, or how the business will benefit from its objectives, including within different key areas of the company. Objectives: On the other hand, objectives are more clearly defined, and provide explicit direction and tactics about the tasks required to achieve stated goals, as well as how these activities contribute to the brand’s marketing success. It can help to think of these in terms of steps. First, you must outline your goals, or the outcomes your company is looking for with its marketing efforts. Next, you can use these goals to create a list of the necessary tasks and initiatives that will help you achieve your goals. Let’s say you want to improve the traffic and engagement on your website. These items – boosting traffic and enhancing engagement with visitors – are goals. The specific strategies you use to achieve these outcomes – including more SEO-driven content, linking to this content on social channels, etc. – are your objectives. It’s important to note that while goals and objectives are different, they are very much intertwined. Specific: The goal centers around something specific, like a certain metric, brand focus or performance indicator. Aspirational: Goals should inspire and motivate your efforts. Realistic: However, it’s important not to set the bar too high – your goal shouldn’t be so aspirational that it crosses the line into unachievable. Time-bound: Finally, set a date. Your goal should include a timetable that defines when results will be achieved. By _____(time/date), the _____(company name) marketing team will reach _____(number/amount) _______(metric). You can also follow up the metric with “every _____(time frame)” to create recurring goals for your team. So, taking this and applying it to our website traffic example, we can see that “improve website traffic” isn’t really a smart goal: It isn’t specific enough; there isn’t anything measurable about it; it’s not very aspirational; it isn’t focused enough to be realistic; and there isn’t any kind of time or schedule attached to it. By the end of Q2 2018, the JessWellsIncorporated marketing team will reach 1,200 visitors each month. Each part of the SMART acronym is important, but it’s essential to keep specificity in mind in particular. This is one area that, if not defined correctly, can lead to significant hold ups in your brand’s ability to meet its goals and carry out its objectives. The more you can drill down and specify your goals, the easier it will be to outline the necessary objectives to get you there. Once you have a rock-solid, specific and measurable goal in place, you and your team can work on defining the objectives that will help you get there. Your goal will help guide your efforts, but it’s also important to lean upon what you know about your audience as you define your objectives. For instance, if you’ve found that your customers respond to snappy, targeted email campaigns, it’s definitely worth considering these as part of your marketing plan (depending upon your goal, of course). The clarity test: Are your goals and connected objectives clear and convey understanding, or could there be ambiguity, particularly with measuring results? If you followed the SMART acronym, you should be good to go here. But it’s always worth a second look. The cost test: Is your goal sufficient and important enough to justify the marketing costs involved? The so-what test: This is one of my favorites, not just when it comes to marketing goals, but all of your marketing team’s efforts. Whenever you create a goal or objective, ask yourself “So, what?” If you’re unable to provide an answer that explains the importance of the goal or objective, it’s time to head back to the drawing board for some adjustments. If you’re having a little trouble getting started with your goals, try the SWOT brainstorming technique. It involves taking a look at your brand internally and externally, and identifying the elements that set your company apart from the rest of the marketplace, as well as the barrier that might stand in your way to success. What are my company’s strengths? How is our marketing better than the competition’s? What tools and resources do we have to help us achieve our goals and support our objectives? What are our weaknesses? How can our marketing plans be improved? Are there any resource limitations that may prevent us from reaching our goal or carrying out our objectives? What kind of opportunities does our brand have? Is there a gap in content that our brand could fill for readers? Are there any emerging trends that our brand could capitalize on? What threats impact the brand? What does the competition do better than our brand? Are there any market conditions or audience segments that might prevent us from reaching our goals? As Ellering explained, your aim here should be to capitalize on your brand strengths and market opportunities you identified, while simultaneously working to diminish your internal weaknesses and external threats. When you and your marketing team take the time to define your marketing goals and establish your objectives in this way, you ensure an actionable focus that’s difficult to achieve any other way. Now, go forth and achieve your goals! Jessica Wells is a senior writer and editor at Brafton, working remotely from Hawaii. When she's not writing, Jessica enjoys paddle boarding, snorkeling and enjoying the view (and a cocktail) from her beach chair.